I’m going to come right out and admit it: I’m super late to the party. Derby Divas is the eighth adventure for Kathi Daley’s Zoe Donovan and her group of friends, family, and fellow townsfolk of Ashton Falls. And yet, it’s my first time solving a mystery with all of them! I had such a fun time reading Derby Divas. Right from the start, I was pulled into Zoe’s inner circle and treated like a longtime friend. And then bodies started turning up and I started feeling a little uneasy! Zoe is busily planning the annual Demolition Derby event and the question at hand is if the male and female drivers will compete together or separately. A spokesperson from each gender decide that an early morning road race will have the final vote and, as unsure as Zoe is of the legality – and the safety – of this course of action, she can’t really stop Boomer or Pandora. But, when the morning of the race arrives, she sure wishes she could have. Pandora wins for the women by a bumper . . . and then tumbles off the side of a steep cliff. Cue the mysterious circumstances populated with questionably shady characters. Derby Divas is a delightful read – and a quick one at that! 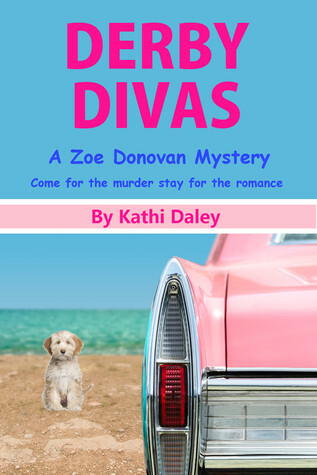 I’m so glad to have been introduced to Kathi (thanks to Lisa from Lisa Ks Book Reviews) and I’m very excited to go back to the beginning of the Zoe Donovan mystery series and get caught up on all the hijinks, troubles, and craziness. I hope you’ll join me on the journey! Disclaimer: I was provided with a free copy of this book in exchange for my honest thoughts and review. Enter via the Rafflecopter form below for your chance to win one of two paperback copies of Derby Divas! (Open to all, but winners residing outside of the U.S. will receive an electronic copy of the book instead of a paperback.) Contest runs until 12 p.m. CST on July 31, 2014. Good Luck! Sounds like a fun read. Used to go to demolition derbies so it would be like old times. I have read a couple and they stand alone very well. Kathy makes these mysteries interesting and so much fun. This is a fresh, new theme for cozies! I’m just getting to Beach Blanket Barbie now—so soon I’ll be ready to read this one. Thanks for the contest.